Searching for a stylish small SUV that truly stands out from the crowd? It’s the best way to get noticed on the roads of Annapolis, Highland Beach, and Hillsmere Shores—all while enjoying a lively drive along the way. If you’re looking for such a ride, you may want to browse our collection of MINI Countryman reviews. You can find car reviews that cover every aspect of the MINI Cooper Countryman for your benefit. 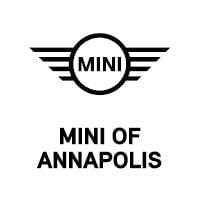 Choose an article to get started—and contact us at MINI of Annapolis with any questions! 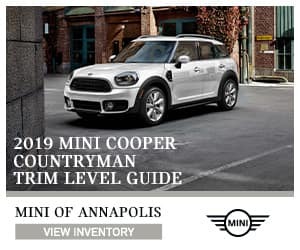 As you’re searching for the perfect crossover SUV, you’ll want to compare MINI Countryman trim levels to find the one that suits your needs best. There are four trim levels to choose from: the Cooper, Cooper S, John Cooper Works, and Cooper S E (the hybrid plug-in model). All trims come with available ALL4 all-wheel drive (AWD), aside from the Cooper S E, where that feature is standard. The upper trim levels come with more powerful turbocharged and twin-turbo engines as well. You can learn more about the differences in engine specs in our trim level reviews! The cabin of the MINI Countryman is adorned with top-shelf materials at every turn. The interior design is still playfully MINI, but you’ll find upscale features, including standard leatherette seating and standard reclining rear seats, for a level of comfort usually reserved for front-seat passengers. If you prefer, you can upgrade to plenty of high-end leather upholsteries, including Chesterfield Leather, with distinctive diamond-pattern stitching. 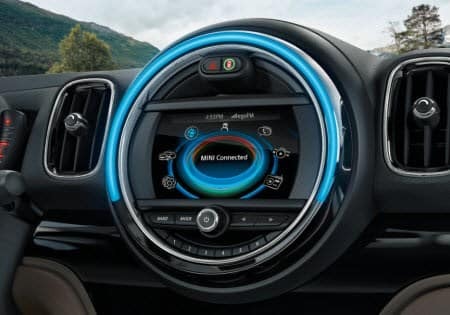 The MINI Connected multimedia system looks good, mounted on the dashboard in that iconic circle, arced by a strip of ambient lighting to draw all eyes front and center. Learn more about the Interior with our MINI Countryman Interior Review! So, what kind of space are you dealing with in this small SUV? You’ll be surprised by how much room you find inside. The MINI Countryman is designed to seat up to five people in all trims. With more than 40 inches of legroom up front and nearly 38 inches of legroom in the rear, this car can easily accommodate adults. Look to the trunk, and you’ll find nearly 18 cubic feet of cargo volume in almost every trim. That’s enough space to hold luggage for a family trip or just your weekly groceries. Fold the rear seats, and you’ll have almost 48 cubic feet available. That’s ideal for all your beach gear—wakeboards, beach chairs, and more! Learn more about the MINI Dimensions with our MINI Countryman Dimensions Review! We’ve given you a good overview here—but are you ready to learn even more about this exciting SUV? If so, you can start searching our library of MINI Countryman reviews right here on this page. When it’s time to take the next step, feel free to reach out to us at MINI of Annapolis. We’ll help you learn more about the MINI Cooper Countryman. We can even get you behind the wheel for a test drive, so you can confirm that this ride is perfect for your Annapolis, Hillsmere Shores, or Highland Beach drive!